Rural “El Rincon de Las Tobas” houses are located in the southeast of the Sierra de Aracena Natural Park and Picos de Aroche, a protected area and weakly populated despite its 29 municipalities that occupy approximately 186,000 hectares. As all well preserved ecosystem, the forest wealth of the mountain range offers also a wide and varied fauna. It is possible to observe mammals like mongoose, deer, wild boar, the genet or the elusive otter; birds such as the black stork, eagles, kites, or jay; In addition to amphibians such as the newt or salamander… to mention just a few. 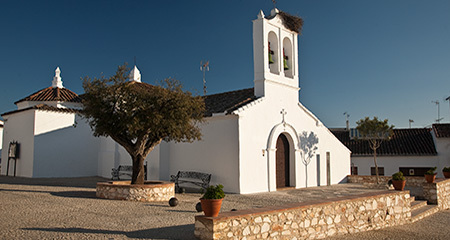 The municipality of Higuera de la Sierra it is a discovery even for regulars of the sierra visitors, as this small town offers one of the most charming urban and best preserved enclaves of the Park. Its origin is associated with the crossroads of Roman roads, and after the passage of Arabs among the S. VIII and XIII, is not considered villa until 1553. It currently has a population of approximately 1300 inhabitants and the economy, as it could not be otherwise, closely linked to the resources offered by the pasture: Iberian pork (sausage and ham salting) and cork mainly. The town, whose attractive made it holder of historic-artistic site in 2003, featuring the beautiful parish church of San Sebastián (declared of cultural interest in turn) and the hermitages of the Cristo del Rosario and San Antonio. Its ethnological heritage, visible through the different eras that dot the surroundings, the set of 3 sources/sinks very well preserved and the alleys that historically have joined the village with the neighboring towns of Umbria and Jabuguillo for example. Already on the outskirts the “Cruz de la Vega”, place of rest and encounter with wonderful views is to be the Mediterranean landscape and represents a cultural landmark for the Higuereños. In addition, Higuera de la Sierra is the starting point for numerous hiking trails and is crossed by the GR-41.3, which runs through all the mountains and branches reaching almost all municipalities of the Natural Park. The celebration per excellence is the three kings parade, which has gained increasing recognition and fame, and which each year is visited by thousands of people. Every January 5th, 16 floats made by families or groups of friends through the streets depicting scenes from the New Testament with such drama and ambiance that is hard to believe that they are non-professionals of the scenery. At the end of August is celebrated the feast of San Antonio, whose peak lies in the Sangría that neighbors drink all together on the long street, at the pace and rhythm of “charangas”. Each summer, and with no fixed date is also celebrated a bullfighting festival with great popularity. The bullring, one of the most beautiful of the sierra, has also welcomed in recent years the charity music festival organised by the local association of young people. When choosing destination, keep in mind that your provider offers you the greatest possible guarantees for respecting the environment. Use natural resources (water, firewood, energy in general…) in moderation. Try to minimize the generation of waste, and dispose of them as it should be. Remember that the protected natural spaces have special rules for its use and enjoyment. Respect it! If you want to take home a memory, look for local products that are expression of the local culture and thus promote its economy (usually very sustainable). Take home fauna or flora will never be a good choice, especially if it is protected. If you wish, enjoy living culture and local customs, approaching them with respect and interest. In short, try to contribute with your presence to the environmental development of the territory visiting..